The illustration note on the copyright page indicates that Dominguez uses “Canson paper, ink, [and] tissue paper … on illustration board.” Angela’s here today to tell us a bit more about this and her work, so let’s get right to it. I thank her for visiting. 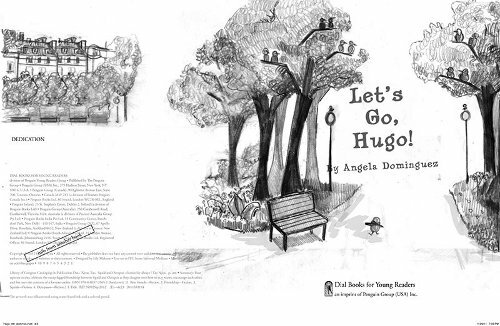 Angela: Let’s Go, Hugo! 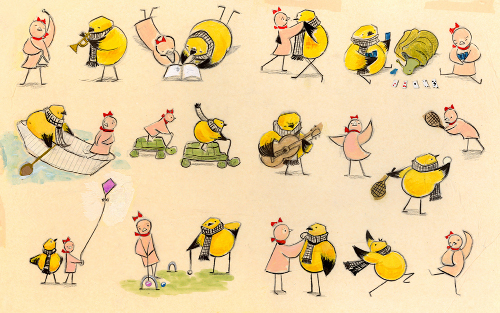 is the story of a Parisian bird, who never really takes off — that is, until he meets Lulu. I work in a variety of materials, including cut paper, ink, pencil, marker, and gouache. I like to work with graphic shapes, expressive lines, and painterly marks. I’m motivated by experience and look at everything, wondering how it could influence my illustrations. I find inspiration from fine art painters, animation, designers, and children’s book illustrators. A few of my favorites are Wayne Thiebaud, Alex Kanevsky, Al Hirschfeld, Mark English, Mary Blair, Hilary Knight, Edgar Degas, Shaun Tan, Ezra Jack Keats, and Evaline Ness. I also find inspiration through teaching at the Academy of Art University. My Hugo character originated in 2003. He had humble beginnings as a wind-up chicken toy that my mother mailed me for Easter. When I’d feel particularly low, I’d wind him up and say, “You go, Hugo!” He was my little art spirit or art mascot. During Fall 2005, I began attending graduate school in San Francisco at the Academy of Art. San Francisco was chilly, and I was wearing a scarf nearly every day. 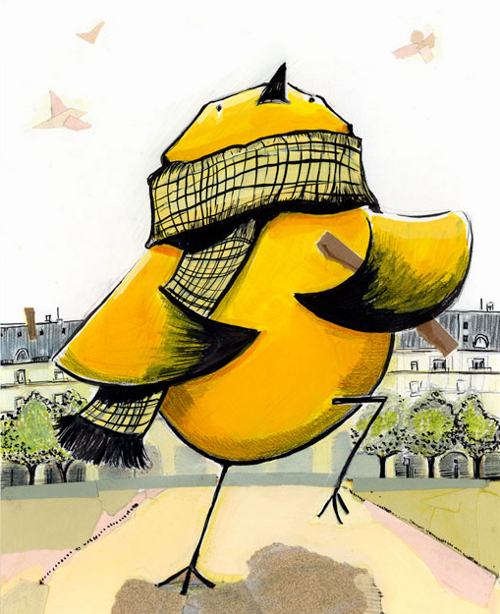 In his honor, I painted a portrait of him in the city, added a scarf, and changed him from a chicken to bird. In 2011, I revisited the character and began doing illustrations. 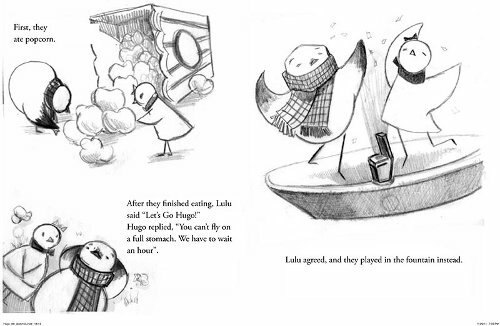 With the suggestion of my agent, Linda Pratt, I began writing Let’s Go, Hugo! In May 2011, Dial Books acquired [it]. I absolutely adore my collaborative team, Jess and Lily at Dial. I have two other titles coming out this year: Maria Had A Little Llama (Henry Holt), based on “Mary Had a Little Lamb,” and Santiago Stays (Appleseed) at the end of the year. In addition, I’m working on new ideas. I never really thought I’d be writing as much as I do, but I love the process. When I was little, I used to write at my Mom’s office on the typewriter at the weekends and draw. I guess I’ve come full circle. Hugo has his own website, if you’d like to check in on his travels. If you want to see more of my work, please visit here and stop by my blog. LET’S GO, HUGO! Copyright © 2013 by Angela Dominguez. Published by Dial Books for Young Readers, New York. All images reproduced by permission of Angela Dominguez. Thanks again to Angela! I’m particularly intrigued by her upcoming titles, aren’t you? 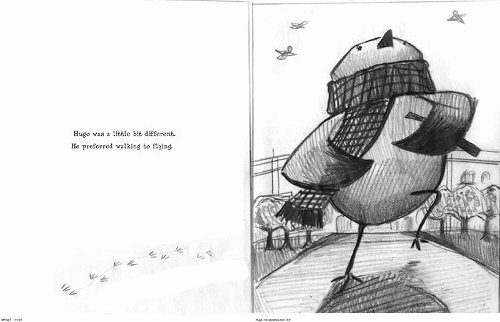 4) I love how generous author/illustrator Jonathan Bean was on Friday in sharing images. 5) Remember this book? This week, it was awarded the 2013 Charlotte Zolotow Award. Very deserving. Congrats to all the authors and illustrators who also received Honors. The info is here. 6) A particularly screamy (that’s putting it mildly) and fear-filled visit, on the part of my eight-year-old, to the dentist makes me extremely grateful that she is a well child and that visits like this, involving needles, are only once in a blue moon. 7) The Nashville writing community, at least in children’s lit, is really a wonderful group of very nice, terrifically supportive people. I was reminded of this when I went to a bookstore book-release party for a local author this weekend. The book today looks wonderful! And I do remember that book in kick #5, so nice to hear it has won an award. I missed your post on Friday starting Jonathan Bean, what a fantastic range of images. I will re-visit tomorrow and enjoy at leisure. 2. And it wasn’t too hot outside for us to sit outside for most of the time – it has been crazily hot here recently. But seeing as nothing is on fire nearby I try not to complain about wilting plants etc! 3. Speaking of which, did you see these amazing photos from the fires down in Tassie? 5. Ants were busy moving down from our roof into a potted plant (see I remembered that you don’t say pot plant in the US!) and although I was very tempted to discourage them with a flood of water, it was too amazing seeing all the little pupae being carried along. Plus they were so organised. 6. Baby sat my 2.5 year old niece after work during the week, and we had a wonderful time watering plants (she was very taken with my tiny watering can), collecting an egg out of the coop and then eating it for dinner, and reading books together. She loves telling her own stories from books to us now, very cute. I love Hugo! I’m looking forward to seeing the book. Oh, Jules, I feel for poor Piper! I don’t blame her screaming. Dental work is terrifying. That Andrew Bird clip is, indeed, lovely, and that SNL sketch cracks me up. I have to start incorporating “Don’t This American Life me” into conversation. 1. I got notice on Friday that HPL will be receiving a $5000 bequest. 2. I had a great meeting with the library board this week where we had a good discussion about our mission and vision. I’ve been laying the groundwork to start redoing these things and moving into branding and strategic planning, which, I know, sounds awful, but it’s actually moving us into important and productive discussions and giving us focus. It’s exciting to see that happening. 3. I bought a new dress, which is always fun. 4. I finished Let’s Pretend This Never Happened by Jenny Lawson, which made me laugh a lot. 5. My mom and I went to the Eastman Museum yesterday, which is right up the street now. It was a lovely day and a lovely walk, and it was good to hang out with my mom. 6. Last night, friends came over for dinner and helped me hang pictures. I’m still getting settled in my new place. 7. This is totally out of the national news now, but in the wake of the firefighters being murdered here on Christmas Eve, there remains so much positive energy and acts of kindness here in our community. People are determined to try to minimize others’ suffering and are doing something about it. It is a fitting living memorial to two men who believed in minimizing suffering. Thanks again, Jules, for introducing us to another delightful character, Hugo. I’m looking forward to this book and other work by Angela Dominquez. Jules: I completely enjoyed your highlighting of Jonathan Bean. Emmaco: I like your heart; watching the ants moving and letting them carry on with their lives. Adrienne: I’ve put the Eastman Museum on my list of places to visit. 1. My amaryllis bulbs are starting to grow. Love Hugo and Lulu! They look like they’re having a fantastic time! And I love how she is inspired by such a wide variety of experiences and art. Just listening to that beautiful song right now. Thanks so much for posting that link. Yay for story-telling and new dresses! 1/ Aforementioned book launch. SO overwhelmed by the sense of community and shared purpose of this group of amazing people, and so happy to celebrate their successes! 2/ Watching my 7yo get two baskets at her game this week and seeing her satisfied smile. 3/ Having lots of projects going, and desperately wanting to work on them. 4/ Realizing that I have 13 days off from work for spring break, and aspiring to tackle those projects with wild abandon. 5/ Introducing favorite people to one another and wondering what good things may transpire. 6/ Napping with cuddly 9yo and listening to the rain. Watching him sleep all curled up beside me and hearing his sweet breathing. 7/ Going to African dance and shaking it as best I could on four hours’ sleep. 3. Sweet and friendly children. 4. Respectful students who are serious about improving. 5. Connecting with teens over K-pop. 6. A Christmas and New Year vacation spent just eating, playing Uno and Monopoly Deal, and sleeping. Kidlit Writer: Hahahah! You’re so funny. You’re really like a character from a book. Kidlit Writer: A character I’m going to create. Hahahah. You find yourself in front of seven identical doors. A voice from above tells you, “These seven doors lead to seven different places: Narnia, Neverland, Wonderland, Hogwarts, Camelot, Middle Earth, and Westeros.” Which door do you go through? Why that door? What happens? Hi everyone! It’s been awhile since I’ve been able to kick here. So glad to see everyone. Especially glad to see Angela’s work. Let’s Go Hugo looks delightful. Thanks for sharing your sketches. Emmaco: How wonderful a day it sounds for you and your 2.5 year old niece. Nothing beats collecting eggs from the coop! Adrienne: I love nesting and getting a home set up with pictures. Sounds like you have wonderful friends!! Jessica: Not sure what sounds better…napping with 9 year old or going dancing! Jules: So sorry your daughter had a rough dentist visit. Have you read Vera Goes to the Dentist by Vera Rosenberry? She gets up and leaves the dentist chair and runs around the block! My kinda girl that Vera! 1) Pilates classes helping with my back woes. 2) My daughter has started asking for her allowance in dimes so she can save her money more easily!! Someone told her that a liter coke bottle filled to the top = $2000. (?) Don’t quote me here. 3) I finalized my first picture book art and now I just need to send it on and work on the jacket! YAY! This should really be #1. It was such a great experience. 4) My 8 year old was sick this past week, which is NOT my kick , but we just happened to get a few Bewitched episodes from our library and we both sat and laughed three mornings away. It’s funny to see so many in a row…I think the plot is exactly the same in each one! That’s all for now. Happy 13th everyone. Thanks again Jules for the post…and Angela for sharing. emmaco, that extended moment when little kids (like your niecelet) start telling stories is wonderful, isn’t it? Great news about the bequest, Adrienne! It’s definitely not a good time to be seeking or hoping for donations for arts/cultural institutions in many places, which must make the 5K especially welcome. Hi, Jessica! My shining moment of scholastic athletics was a two-minute pity stint in a single 8th-grade basketball game when I ran up and down the court a few times and prayed no one would pass the ball to me (my prayers were rewarded); I can barely imagine the excitement your 7-year-old must have felt. LW — I’m not sure what door I’d pick (I kinda wish there were one to 221B Baker Street)… probably Middle Earth, as long as it landed me in The Shire or Rivendell. Or maybe Treebeard’s upper branches. Somehow, before clicking on your link, I managed to guess which one *you’d* pick. Heh. 4. Finding out that an upcoming big-and-new technology won’t be nearly as unpleasant and ugly and distruptive as feared. 5. Turning on the Christmas-tree lights one, last, time before taking the tree down. 6. Newly begun stories, even when followed by the word maybe. 7. Suddenly realizing you’ve been asleep for a minute or two, on a night when it’s okay to just hit the mental Pause button for a moment, get undressed and under the covers, and then hit Resume without losing the train of sleep. P.S. Lori — $2000 may be optimistic. I found a couple of sites that calculated the volume of a dime, and then — I remembered your bottle as TWO liters — ran the division myself and came up with less than 6000 dimes (or $600). And that more or less assumes that the bottle is completely filled with dimes — no air between them, which is impossible. So in a ONE-liter bottle, maybe $200? Yeah. Maybe your figure was off by just a decimal place. Emmaco, she is two-and-a-half years old already? Seems like she was born yesterday, as cliche as that sounds. It has been warm here, too, and it’s not supposed to be. It’s January, for crying out loud, and we had our air conditioning on yesterday. I get cold in seventy-degree weather, but even I think that’s depressing (for winter). Adrienne, congrats again on the money. SO DESERVING. That is a lot of great money to spend, too. Kick #2 makes me cheer, too. Your last kick gives me hope for the world, and I’m glad you had good, quality time with your mother. Jess: Yes, she is inspired by a wide variety of artists, both contemporary and long-gone and both in children’s lit and not-children’s-lit-at-all. Or, what John said: Cocktail party, please … I love all your projects and your eagerness to write. Again, you’re the hardest-working author I know. Tarie, that is a great exchange. Also, I love Uno. And the other day in the middle of dinner, my seven-year-old wondered aloud if Spanish speakers yell “ONE!” during that game when they have one card left. … Your students are lucky, Tarie. I say that all the time, but it’s oh-so true. Little Willow—I mean, Tink—that was fun to read. (I wish I could leave comments over there … I can’t get it right.) Good choices. I’d have to choose Hogwarts first, or my daughters would kill me for the missed opportunity … Hope your day is good, LW. Lori: No, haven’t seen that Rosenberry book, but I’ll look for it. …Congrats on kick #3! OH MY GOSH, exciting. And I love your daughter for doing what she did. John: Yes, the book is wonderful and is also a big Newbery contender right now. (What’s that? How many days till the big ALA Awards announcements and the CALDECOTT IS ANNOUNCED? Why, it’s just 14 days away!) I read this book, John, for a book club meeting tonight (I normally don’t do book clubs, ’cause I read on my own slow schedule and I also don’t like being told what to read! 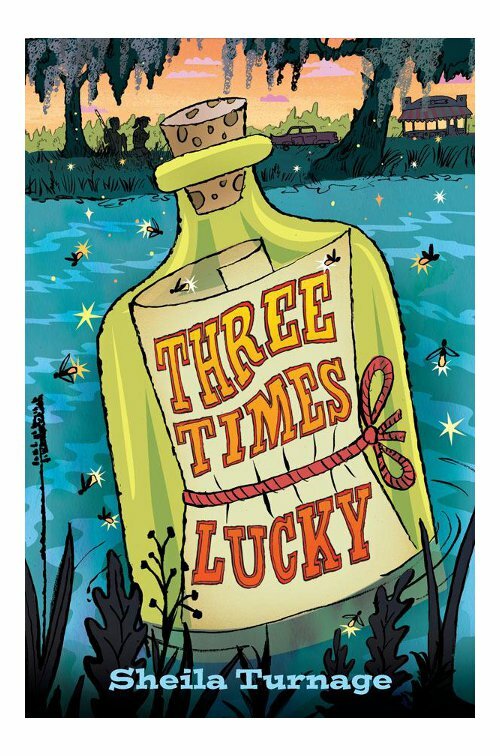 But I couldn’t pass this group of smart, smart people up), and I had a serious disconnect with the other book we read (just never got invested in it), but really, really love Three Times Lucky. … I GOTTA WATCH DOWNTON ABBEY ALREADY. (Good news: I read this week that West Wing made it to Netflix. Want to start that, too.) … I like your kick #6. 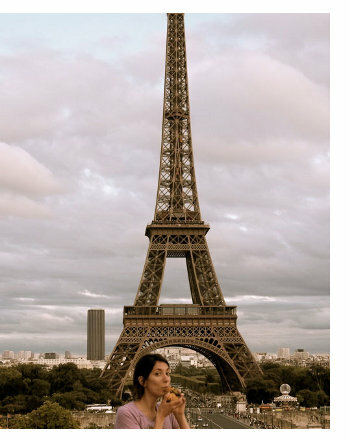 I just finished reading, “French Milk” by Lucy Knisley so I was in a Paris state of mind when I read this post. 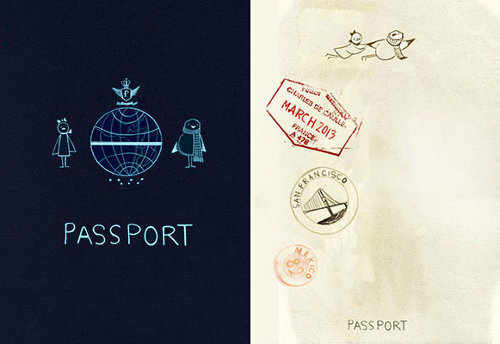 The images are lovely. Thank you for sharing. Jules – Love the links and I do remember kick #5. Happy to hear it being praised. Sorry about the scary trip to the dentist. Tarie – Happy New Year! LW – I think I would feel safest in Wonderland. Lori – Kick #3 (which should be #1) Hooray!! Can’t wait to see it. JES – I am glad the Patriot’s game will be over before the start of Downton so I don’t have to wait another day to watch. Margie, spam ate your kicks! I just saved them, though. So sorry, on behalf of 7-Imp. Moira and Margie, back soon …. Margie, you always have such good, rich kicks, which remind me that the best kicks are the most elemental things. I’d like some yellow shoes, too. I like yellow. One day, I want a yellow house (exterior). Moira: We purged the daughters’ room this weekend, a painful activity (only for me, evidently), but the girls gladly gave away, like, 95% of their dolls. They’re all about LEGOs now and just wanted to make room for them. LEGOs, LEGOs, LEGOs, they are all things LEGOs. … Also, I’m glad your family is nearby. This makes the 13th comment. Fitting. Hello to Angela – and Hugo, and LUlu – Pleasure to meet you. The book looks like fun. 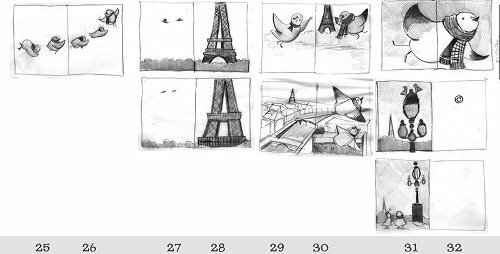 Digging the storyboard and sketches. Best of luck with your forthcoming titles. I particularly like the sound of Mary Had a Little Llama. Jules: Sending comfort to the little one. Glad that the community is so supportive! Listening to/watching the Andrew Bird performance now. emmaco: I hope you are not sweltering. I heard about the heatwave and couldn’t fathom the 122+ degreees. Enjoy the journals, the friends, and the feasts! Adrienne: I hope it’s starting to feel like home for you. Margie: What do your new yellow shoes look like? Yay for stars and sunshine. Hi to Xena. Jessica: Congrats on the book launch! Sounds like you had a verry happy week. Introducing folks is always fun. Enjoy. Tarie: I knew that was your post/your list just from the first item! I know someone who loves K-pop. She played I Got a Boy in my store this week. Lori: Welcome back! Sending healing thoughts to your injured back. Congrats on finalizing your PB art. Healthy vibes for your kiddo, too, and kudos for your book donations. JES: Indeed – it would be Wonderland for me, no contest! Good luck with the writing. Moira: Yes! re: Wonderland. And, also, braids. Just a fly by to say hi to all kickers today. Limited Internet as I am at my daughter’s house. Oldest grandgirl is in seventh heaven. Our water main broke to the house so we don’t have water. Hopefully it can be fxed tomorrow….yikes. Sorry to hear that, Jone, but yes, it’s good news for the granddaughter! Enjoy it. Hope things get fixed soon. Yes, we still read your blog! And I understand about the pesky spam. I wonder why you got *so much* spam? That’s A LOT. What is Can’t Hardly Wait? I’ll have to look it up. Jone: Hope the problem is resolved soon! You’re so lucky to have family you can stay with and that you’re still safe and sound, even when temporarily displaced. Little Willow, I love “I Got a Boy”! It’s from Girls’ Generation. Please tell your friend that I am watching Girls’ Generation in concert this Saturday!!! Andrew Bird – good grief, this is wonderful. Kickers – awesome all! What good lives. I am nearly delirious from lack of sleep caring for 5 week old darling foster baby we call B. Keep forgetting to stop by on Sundays, but catching bits of kicks and other posts when I am up in the night with her. 1. Baby B is growing and thriving – we are thrilled. 3. incredible evening of story telling and reminiscing (uh-oh, too sleepy to remember how to spell) with long time, dear friends and family tonight – the atmosphere was joyously sacred. 4. My big Little has gotten out his baby doll to dress in Baby B’s clothes and he cares for his doll the way we do Baby B. It is hilariously touching. 5 to 7. Snazzy goodbye lunch on Sat. at Ethiopian restaurant for a friend moving to Madison. Also very touching to be on a room of people committed to fostering and adopting children from around the world and from our city who needed a chance to trhive and now have been given that chance. The world is full of so many kind and generous people carrying out acts of love and kindness every minute. Never mind what the news says – we will continue to thrive. Hugo is so adorable and I love his enthusiasm. Jules, congrats on the 313th kick’s post! emmaco – lazy breakfast with friends sounds amazing. Adrienne – I loved Jenny Lawson’s book too – parts made me laugh out loud. Glad your community is staying so positive and pulling together. Margie – spotting a bald eagle is so magical. Jessica – matchmaking favorite friends is so fun. Tarie – your vacation sounds pretty perfect. Lori – hooray for you and your daughter – so incredibly thoughtful! John – I wanted to to tell you I loved your comment a few weeks ago about me being surrounded by kids, friends and dogs sounded like my kind of atmosphere (paraphrasing here) – it is, and I love that you know that from me kicking here for a couple of years. Have to check out Downton Abbey – and yay for complex work assignments. Moira – yay for braids, basketball, and family near by. LW – I would pick Narnia. It was one of my first of all those series, and I have a serious soft spot for Aslan. Thanks for the write up on Bone – I just bought the series for my nephew! Allison – so happy baby B is growing and thriving! 1)Cole’s yearly at the vet’s – he’s lost a couple of pounds and is super healthy after 1 year with me! 2) A fire in the fireplace while it’s freezing outside. 3) Lots of big work accomplishments this past week – not a lot of sleep involved, but well worth the outcomes at the end. 4) An apology two years later from someone I care for deeply. I had already forgiven them, so very glad they were finally ready to ask for it and receive it. 5) Goodbye drinks with a good friend moving out of state – so proud of them for taking a huge leap into the unknown. 6) Laughing at myself for being a dork – put my xmas tree in the car to take to recycling, but they’d closed up for the day so it turns out I just took my old tree for a ride in the car. 7) Have all the episode of The West Wing now to dive into – friend who is moving brought them to me to borrow – I may just take some time off of work to watch them all!!!! Last kick – I am so loving the new series Nashville and am really into the music as well. This video made me think of you and your daughters Jules! Adrienne, if you’re hanging pictures already you sound pretty settled in! From what I’ve seen on your blog your new place looks very interesting – hope the settling in continues to go well. Allison glad to hear baby B is doing well! 5 weeks, wow, best wishes to you! And a lovely final kick. Rachel, enjoy West Wing – a friend of mine managed to get through all the series very speedily after I lent them to her when she said how much time she was spending nursing her baby on the couch! Jules: That spam must have been hungry. Thanks for making it give up my kicks. Have a great week. Little Willow: Here is the the link to my new yellow shoes. They were a splurge to be sure using some Christmas money. I like to think I’ll be walking in sunshine. Oh, more kickers! I’ll be back tomorrow, promise! Allison, ohhhhhh, congrats on Baby B. I hope you enjoy every moment and also get as much sleep as possible. What a lucky child. I like the reminder in your last kick. Jules – hope you put West Wing in your queueueueue…..I am doling episodes out to my self as rewards. And those little girls are Lennon and Maisy Stella – their parents are the duo The Stellas. Thanks for the sweet words about Cole, I’m pretty stoked he’s doing so well, he’s a sweetheart. Tarie: Have fun at the concert! I am sure she would be extremely jealous and beg you for details. Allison: Yay for you and your family! Very sweet that he is showing care as well. Best wishes to all of those generous hearts! Rachel: I hope your nephew digs the Bone: Quest for the Spark trilogy! So glad that Cole is doing well. Your 4th kick – wow. And Aslan. emmaco: Hope you can stay cool in that heat. Margie: I challenge you to sing, I’m walkin’ on sunshine – Whoa, oh! in a public place while you are doing just that.